A dangerous brownie recipe laced with Revels, a surprise in every bite. The make is just the same as the mini egg brownie recipe, melt the butter and chocolate and leave to cool slightly. Whisk the eggs and sugar together, and add to the cooled chocolate/butter.sift in the flour, salt and revels (I mixed the revels with the flour first to stop them sinking to the bottom) Once fully combined, pop in a lined brownie tray (my mix filled two small trays) and bake for 20-25mins at 180C until the top is lighter and cracking slightly.Leave them in the pan until cooled and chop them into the desired size chunks. It is so tempting to gobble them up still warm but I must insist that you wait for them to cool completely, in fact I would say if you have the patience and will power; leave them until the next day, the revels will have re-set and the brownie achieves its perfect level of fudgy-ness. I named these beauties Russian Roulette Brownies, it was actually the boyfriend who named them, as he said you were never sure what flavour you were going to get. The caramel and orange were my personal favourite, I will definitely be making these bad boys again very soon, as well as experimenting with some other flavours; any requests? Apologies for terrible photo, late night emergency baking does not allow for the best photo-taking. this is such an awesome idea, I know a couple of friends who'd really appreciate these. Ooh I love this idea. Taste sensation everytime! These look heavenly! I'm still yet to make a perfect brownie they seem a lot harder then they look. Mine often come out really stodgy inside. 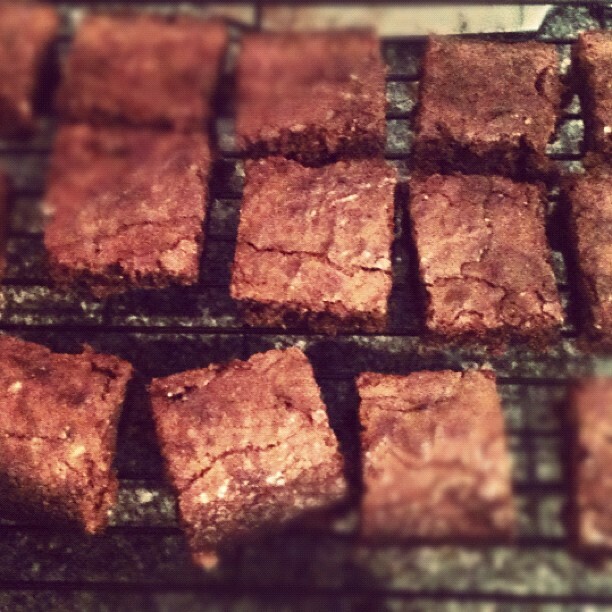 I had such issues with brownies, they were either too cake-y and dry, or far too wet and sickly. These ones are the BEST I have found by far, crisp on top and fudgy in the middle. I would say it is best to leave them to cool completely before cutting. Bookmarked! I loved your mini egg brownies too. It's difficult get the correct crisp/fudgy ratio for brownies. I wonder if oozey chunks of cadbury caramel bars would be good in brownies, or perhaps it would be too sickly. I have never baked anything in my life, however after reading your blog ( and seeing the pictures- yummy! ) I feel like trying :-D Very tempted!